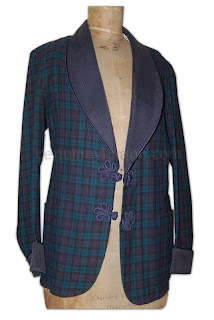 A very nice tartan smoking jacket with large grain, ribbed silk shawl collar and cuffs and a double frog closure. Remnants of the interior label state: Heather Brae/ Authentic/Worsted Tartans/ from imported Botany Wool. Size is about a 40 - 42. In superb condition.